After a grand success on big screen of Bhojpuri Cinema, The pair of Nirahua(Dinesh lal Yadav) and Amrapali dubey is also rocking on outside the country. Yes, your most favorite couple of Bhojpuri film industry has recently done a show in Doha, Qatar. In the previous week, Nirahua & Team have done a Marathon show of 4-Hours in Doha, Capital of Qatar. The show title was “Bhojpuri Dhamaka” & it was a super hit show. The crowd of thousands indian people got the taste of their culture & music. it was a biggest Bhojpuri show ever outside of India. Bhojpuri item queen Seema Singh, Pravesh lal Yadav, Pakhi Hegde, Shubhi Sharma & Anara Gupta participated in the show & made it a grand success. Vision Group, The organizer of this show also told that It was the biggest show of Bhojpuri in any foreign country. There are many shows, we have organized but this type of crowd in any Bhojpuri Show we have never seen before. it’s a proud moment for us. After watching the grand success of this show, we have decided to organize more shows targeting Bhojpuri audience in other countries. According to the internet analytics, Millions of Qatari Bhojpuri speakers watch Amrapali Dubey & Nirahua’s all movies. Nirahua also told that i’m very happy to perform in front of thousands of indians outside of india. 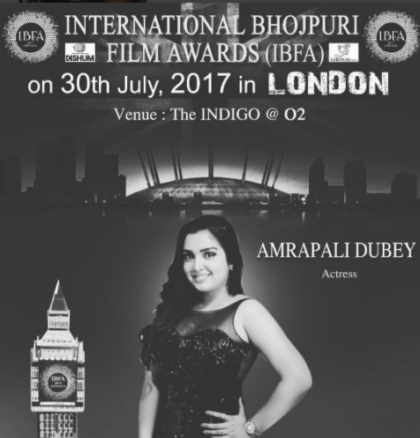 Bhojpuri queen Amrapali Dubey also shows respect & love to Qatari Bhojpuri audience. Amrapali dubey & Nirahua performed together on the songs of Nirahua Hindustani, Patna se pakistan and Nirahua Rickshawala 2. The show had started with the popular song “Nirahua Rickshawala” & attraction of the whole show was performance on the song “Nayi Jhulani ke chhaiya” of Amrapali and Nirahua.